Description: Pineapple is native to South America and spread to Central America and Mexico where the Aztecs cultivated it. 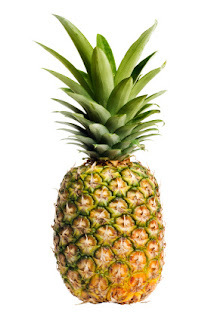 The name pineapple has its roots in the Spanish word: pina, which means pine, due to its resemblance to the pinecone. Pineapples have a “wide cylindrical shape, a scaly green, brown or yellow skin and a regal crown of spiny, blue-green leaves”. As one gets closer to the bottom of the fruit there will be more sugar content, which in turn creates a sweeter taste. When choosing pineapples, one should pick one that has no soft spots, and has a sweet smell at the stem, as opposed to musty, sour or fermented smell of a rotten pineapple. Kitchen Pharmacy: Pineapple contains bromelain, which helps your digestive track by breaking down proteins; it also has anti-inflammatory, anticlotting, and anti-carcinogenic properties. Pineapple is also a great source of copper, potassium, manganese, riboflavin, vitamin A, and vitamin C.